Auto Repair, exhaust header fabrication, transmission, performance engine work, hitches Clinton TN. Here at AutoCade Inc. Pre-Owned Center we know everything there is to know about a vehicle! We are not just the place to shop for a quality pre-owned vehicle if you are looking for a new ride but also the place to go if your vehicle needs mechanical repairs or maintenance, a new set of name brand tires or anything else needed to keep you or get you back on the road! From oil changes, batteries, brake systems, shocks, air conditioning, radiators, belts, hoses, mufflers, exhaust, tune ups, starters, fuel pumps, sensors, window motors and regulators, headlights, taillights, windshield replacement, EGR coolers and EGR deletes, new or used tires, tire rotation, tire repair, tire balancing, a new or used engine or transmission replacement or even a trailer hitch installation we've got you covered! Visit Our Services page to see some of the automotive repair & vehicle maintenance services we provide. If you need a service not listed call us! We have access to name brand tires such as Michelin ®, BFGoodrich ®, Uniroyal ®, Bridgestone ®, Cooper ®, Nitto ®, Goodyear ®, Toyo ®, Sailun ®, Mastercraft ®, and many other leading industry names and can mount and balance whatever tire you choose! We offer pricing and installation of Jasper ® gas and diesel engines and transmissions for almost any year, make and model of vehicle. We are an authorized dealer and installer of BulletProofDiesel ™ products, so if your Ford 6.0 Diesel needs an EGR cooler or EGR delete, or you have a Ford 6.0 or 6.4 diesel truck or van that is in need of an engine oil cooler give us a call. If you need a turnoverball ™, gooseneck hitch, RV hitch, receiver hitch, adjustable ball mount or any other product offered by B&W hitches we are also an authorized dealer and installer for them as well. 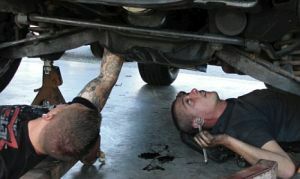 Routine maintenance is highly recommended by us! You will extend the life of your vehicle and avoid very costly repairs if you maintain it. We recommend that all regular routine maintenance be done at factory recommended intervals. Things such as changing your oil and filter, transmission fluid and filter, antifreeze, brake fluid, air filter, fuel filter and even something as simple as rotating your tires will make your vehicle outlast and outperform vehicles that are not routinely serviced. Please visit our Suggested Automotive Maintenance page to learn more about when you should maintenance your vehicle. Whether you are from Clinton, Norris, Andersonville, Lake City now known as Rocky Top, Oak Ridge, Knoxville, Oliver Springs, Rockwood, Harriman, Briceville or other surrounding area, if you are looking for a new ride or need repairs to your current ride, we invite you to stop in. Come and see for yourself why so many people consider AutoCade Inc. Pre-Owned Center not only the one stop shop to consider when thinking of purchasing a vehicle, but also the one stop shop for all their automotive repairs and maintenance too! We offer very competitive prices and stand behind our work with a guarantee as well as warranty's on all parts. Pricing and installation is also available on Jasper ® marine engines, stern drives, outboard lower units or outboard powerheads for those of you who need to get back out on the open water instead of back on the road. Here at AutoCade we even do some performance engine work! Check out the initial startup on this 400 Small Block we built for a 1974 Chevy LUV. 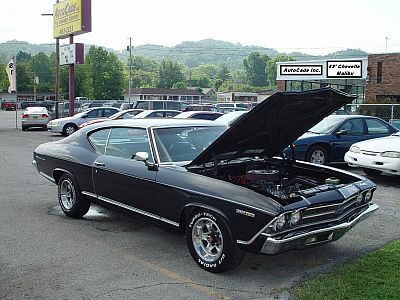 The truck and Chevelle have been in the family for years. It belongs to our webmaster Jared (my little brother). We installed some Aerospace Components front and rear disc brake kits on both the Chevelle above and the LUV Truck. For the engine build, we started off by boring the block to make it a 409 cu inch, then started off with a 4340 Eagle Crankshaft and connected MAHLE pistons using Eagle H beam connecting rods. Next we slid in a Competition CAMS custom grind cam (PN #12000-9, SN S7619-10, Grind CS 4404S / 4407S R10. 900). It has a .050 inch lift and the intake and exhaust duration is 258/264 respectively with a 110 degree lobe separation. After connecting the timing chain we topped it off with a set of aluminum performance heads made by Canfield Heads (PN 23-600-65-1, SN 0801-7393 on the driver side, and SN 0801-7383 on the left) The Victor E Eldebrock intake manifold came next. When we ran the compression test it showed us a strong 190 psi. Firing the motor off is a Mallory Unilite distributor PN 4748201. We turned our attention back to the rear of the truck knowing this engine needed some serious traction. We went over to Calvert Racing and got a set of their caltracs to install on the new 9 inch Ford rear end we shortened before sliding in some Strange Engineering axles. Next on our to do list is the exhaust. We offer header fabrication services as well. We have built custom stainless steel headers and turbo headers using our icengineworks header design kit. Go on over to Our Services page and check out what we can do for you. Towing services are also available. If you find your car, truck, van, wagon or SUV broken down because of a flat tire or other engine malfunction, we will tow you to our repair center for competitive towing rates and provide affordable automotive repair services.